Adam West's Batman as a Mego-style action figure. 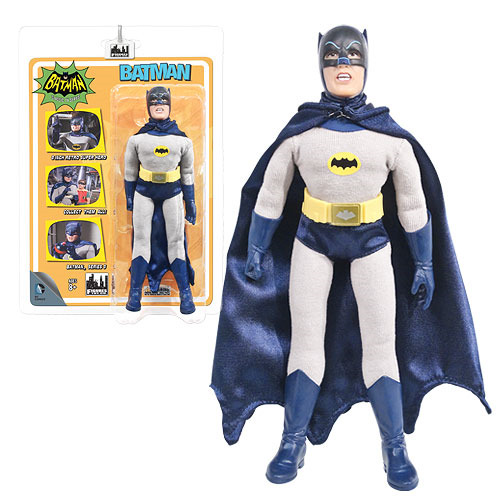 Celebrate the classic Batman 1966 TV series with this great retro style action figure! The Batman Classic 1966 TV Series 3 Batman (New Sculpt) 8-Inch Action Figure features a fantastic take on the Caped Crusader, rendered in the classic and beloved Mego action figure styling. Measuring 8-inches tall and featuring over 15 points of articulation, this figure of Batman is a must-have for fans of the classic Batman 1966 TV series! Ages 8 and up.